Andy Ivy's dream of a trail running along the Tobacco River has come true! 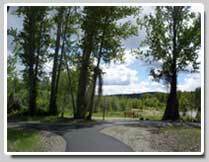 We hope you enjoy the new Eureka Riverwalk. Andy, a retired Eureka physician has pushed for over five years to develop a nature walk along the Tobacco River bottoms immediately south of Eureka. 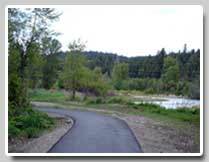 The trail would not have become a realty if it were not for the support of the County in planning & development and providing funding through the CTIP grant..
Buck Schermerhorn, president of the foundation said trail design is a very important issue. A raised trail for instance, might impact river flow and trout habitat. to get order yours today!